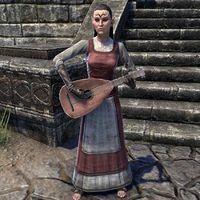 Elphinia Light-Tongued is a Bosmer bard who can be found behind the Alcaire Castle. She is acquaintances with Dame Dabienne and is on the lookout for stories that she can make a high-tipping song out of. "Don't mind me. I'm just trying to compose something for the Duke and his lady. I understand she has taste and pays good coin. That's if they stay together long enough to perform. There's a lot of tension in that court right now." "Wait—aren't you the person who rescued Dame Dabienne from those made villagers? yes, I'm certain you are! She described you perfectly. Do you have time? You must tell me everything. I can write a song about you! "Well, I only heard a little when Dabienne reported back. Something about crazy villagers locking her up and planning terrible things. How about you tell me what happened?" Yes, the whole village was mad. If I hadn't saved her terrible things would have happened. "Terrible things? Always a crowd-pleaser. What kind of terrible things?" The town was attacked by slavers. The constable locked her in the stocks. I proved she wasn't a spy for some slavers. "Ooh, slavers! That's good. The crowd always loves slavers—as villains, that is. So you fought a great battle against them, one against many and then defeated their captain in single combat?" Not really. I got the ship's ledger which proved the crew weren't slavers. "Oh. I suppose I can work with that." In the end, the villagers let Dabienne go and locked the Constable in the stocks. "This is going to be a bigger challenge than thought. Maybe a comic tale. "How the Constable Got His Comeuppance." You'd be the hero, of course. I'm sure I can make a good story of it." "Wonderful, a heroic fight for the finish. "And then Dabienne swooned in your arms as you freed her from the stocks?" You have met Dabienne, haven't you? "Ah. Good point. Dabienne might not like that. It's a shame. A romance always generates good tips. Well, a heroic tale it will be! Thank you for your help." Yes. It was a very passionate moment. "Wonderful! Slavers, swordplay, and a romance—I can hear it all now. It's sure to be a crowd pleaser. "Well, I may have to fill in a few gaps—a chase or a mystical amulet or something. Don't worry, you'll be famous!" The constable was mad from nightmares. And there was an attack by a Dremora. "Nightmares? Dremora? No, that's just too much. You can't just throw anything into the tale. I think a jealous constable will work much better. And we don't mention the Daedra. That will be much better. You'll see." This page was last modified on 28 June 2018, at 05:29.